Government Higher Secondary School, MMDA Colony, Arumbakkam, is one of the schools that require support from TNF. GHSS was started as a middle school in the year 1962 to empower deprived children living in and around Arumbakkam area. It was upgraded to Higher Secondary in the year 1986 to help students continue beyond High School. The school has both English and Tamil Medium. Currently, the school is providing education to 1837 students (Girls and Boys) with 72 regular teachers and 12 PTA staff. The school was affected by flood in 2015. With the support of local donors – the school was able to put furniture and fittings in place. One of the buildings is still unstable and looking for donors to renovate the building. There was also a noon meal center which needed flooring and roof to be repaired and replaced. The school allows Student Volunteers from USA for Internship to learn and share as part of Educational Service and Internship Programme. TNF thought of a pilot project to be implemented in Chennai, which on success, to be replicated in rural schools across Tamil Nadu. This project was developed with the support of various partners –a Life member in TNF USA, Mr. Sam Senguttuvan came forward to provide 30 computers, LCD Projector, Screen and power backup system through Trivent Systems Pvt. Ltd, Subsequently, Vetrivel Foundation was connected with TNF to provide relevant content for teaching Mathematics for class 6 to 8. Finally, Ramco Group came forward to support the recurring and non-recurring expenditure to improvise the classroom environment with proper infrastructure, added computers and facilitator for implementing the project. Total project cost is worked out to nearly Rs. 30 Lakhs. This Digital classroom is expected to bring significant progress from the students respective base levels with confidence through self learning, in spite of the fact that they were not exposed to technology earlier. About 250 students will benefit out of this project every year. Deepa, the Math Teacher says, “it’s a gift for our students. Generally Math is considered as tough subject. They see the videos first and follow the steps to do the exercises, They do it with interest. This promotes self learning. Students enjoy doing Math through computers and learn fast”. School Head Master Dr. Sekar, said, “Through TNF our school got this facility of digital classroom where individual learning without any disturbance is provided to every student through computers. We are already in the next stage of learning as in future learning is going to be fully digitalized”. A function for dedication of Digital classroom was organized on 11th September 2018 at Government Higher Secondary School, Arumbakkam, Chennai . Thiru. S. Rajarethinam I.A.S. 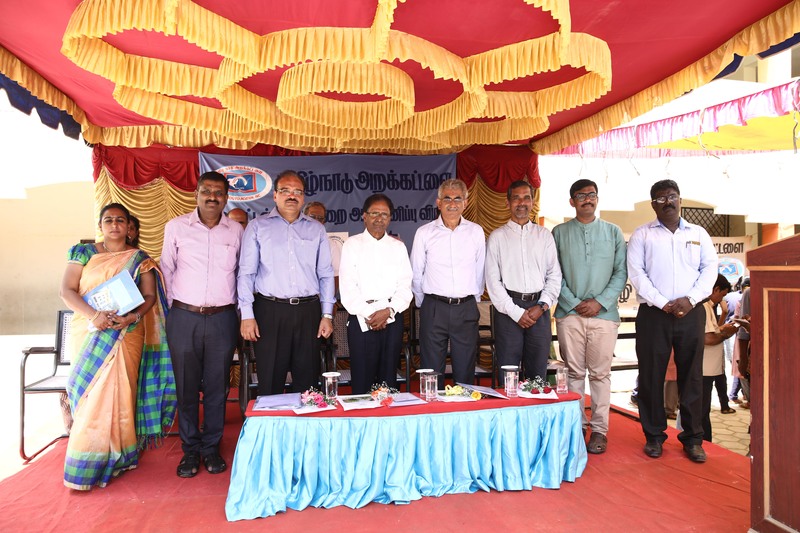 (Retd)., Chairman, TNF TN Chapter presided over the function. Thiru. Pradeep Yadav I.A.S., Principal Secretary to Govt. School Education, was the Chief Guest. He accepted TNF Chairman’s request to sign a MoU to implement similar programme and other Government schools. Dr. Rameshwara Murugan, Director, School Education, , Thiru . P.R. Venketrama Raja, Chairman, Ramco Group, Thiru. Elango Shanmugam, Managing Director, Trivent System Pvt. Ltd, Thiru. Vijay Radhakrishnan, Vetrivel Foundation, Tmt. Thiruvalarselvi ,Chief Educational Officer , Chennai were the guests. Dr. Sekar, Head Master, Govt. Hr.Sec.School, Arumbakkam welcomed the gathering and Tmt. Vasumathi Benny, Executive Director(Projects), TNF proposed vote of thanks. Rs. 4 Lakh with dining facility for about 150 students at a time. At the end of the function, all the students were given flavored milk which TNF received on a discounted rate.